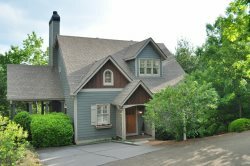 There is a queen master suite on the main floor as well as a kitchen with an eat-in area for up to 10 people, a laundry room, den and a deck with a screened in porch and fireplace. A queen bedroom is located upstairs with (2) twin beds in the loft area and a bathroom. On the Terrace level there is (2) twin bedroom, and another (2) twin bedroom, each with a private bath and a sitting room. The home also includes a full lower patio.